Solve the mystery of Poe's death - the clock is ticking! 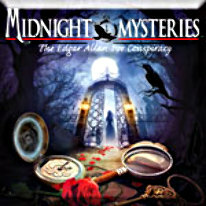 Midnight Mysteries The Edgar Allan Poe Conspiracy presents you with a 160 year old mystery, 30 ghosts from the past, and only 24 hours to piece all of the clues together! In this chilling tale of the mysterious and untimely death of Edgar Allan Poe, you'll take a shadowy journey to try to solve the mystery of his death. As a famed mystery writer, you’re looking for your next cold case to crack when an unexpected visitor hands you an invitation and the perfect case to get your career moving again. In this seek and find adventure, you'll travel through the tales of Edgar Allan Poe to collect clues, interview witnesses and piece together the conspiracy behind the death of one of America's greatest writers. Who killed Edgar? Was it the publisher? His fiance's brothers? Or could it be that Poe knew too many secrets about the wealthy store owner? You have 24 hours and ghosts of the past to guide you through Midnight Mysteries The Edgar Allan Poe Conspiracy!